The Love Live project revolves around a group of young school girls who become idols to save their school is obliged to close. An animated television series of thirteen episodes produced by Sunrise and directed by Takahiko Kyogoku was aired in Japan between January 6 and March 31, 2013, followed by a second season between April and June 2014. 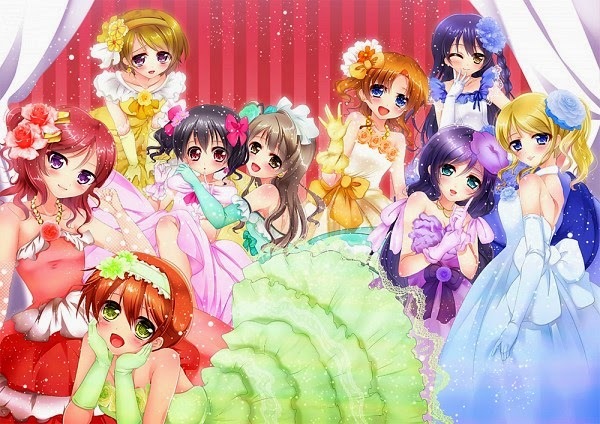 The opening theme is "Bokura wa Ima no Naka de" ( We Are in the Now) and the ending theme is "Kitto Seishun ga Kikoeru" (Surely Our Youth Can Be Heard) , both played by μ's ( Emi Nitta, Aya Uchida, Suzuko Mimori, Yoshino Nanjo, Pile, Riho Iida, Aina Kusuda, Yurika Kubo and Sora Tokui). Honoka Kosaka is a girl who loves her school, the Academy Otonokizaka. When closing is expected because of a lack of candidates, Honoka is determined to save his school. 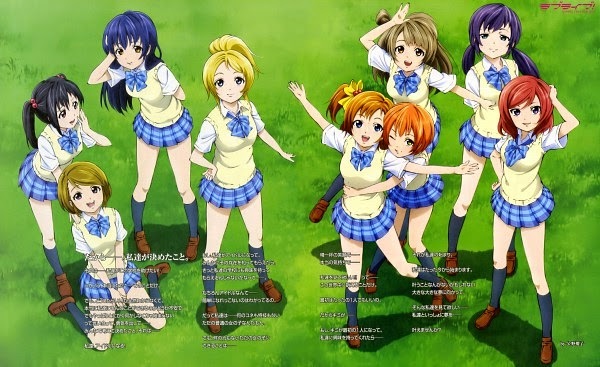 Knowing that the idols of the school are very popular, Honoka and her friends start to a school idol group, μ's (pronounced Muse) to attract new students in their school. mubou na kake? kachi ni ikou! egao nara itsu no hi mo daijoubu!